In the name of Allah, Most Merciful, the Bestower of Mercy. So magic is what Allah has decreed by His universal will and He forbade it by His legislative will. This is similar to the will of Allah wherein He has decreed unbelief to occur and He forbade it by His legislative will. 1. Illusionary magic (Sihr at-Takhyeel). 2. The magic that has an actual effect (Sihr at-Ta’theer). B. That which afflicts many people and even afflicted the Prophet (salallāhu ‘alaihi wasallam) when Labeed Ibn A’sam Al-Yahoodi (may Allah’s curse be upon him) performed magic on the Messenger. So, Angel Jibreel (‘alaihis-salām) made ruqyah (supplications and recitations of cure) upon him with the last two Soorahs of the Qur’an. And he told the Prophet (salallāhu ‘alaihi wasallam) where the articles of magic could be found. Bukhari (5766) and Muslim (2189) reported from ‘Ā’ishah (radiyallāhu ‘anhumā) that she said: “Magic was worked on the Prophet so that he began to think that he had done something though he had not. One day, while he was with me, he made a lengthy supplication to Allah and then said: ‘O Ā’ishah, do you know what Allah has instructed me about what I asked him?’ I said: ‘What is it, O Allah’s Messenger?’ He said: ‘Two men came to me, one of them sat at my head, and the other at my feet. Then one said to the other: ‘What is the illness of this man?’ The other said: ‘Magic.’ He then asked: ‘Who did the magic?’ The other replied: ‘Labeed Ibn Al-A’sam Al-Yahoodi from the tribe of Zuraiq.’ He asked: ‘Which what did he make magic?’ He replied: ‘With hair wrapped around a comb and a skin of pollen of a male date palm tree.’ He asked: ‘Where is it now?’ He answered: ‘In the well of Dhī Arwān.’ After that, Allah’s Messenger went with some of his Companions to the well. When he reached it, he saw that it was surrounded by date-palm trees.” Then he returned to Ā’ishah and said to her: “By Allah, its water was red like as if infused by henna leaves, and its date palms were like the heads of devils.” Ā’ishah asked: “O Allah’s Messenger, did you take it out?” He replied: “No. As for me, Allah has already cured me, healed me and given me well-being. And I feared that evil would come upon the Muslims from it.” Then he ordered that the well be filled up with earth, and so it was done. 1. Allah, the Most High, informs us that it was the devils who disbelieved due to their teaching the people magic; and their fabrication of a lie upon the Prophet Solomon (‘alaihis-salām) in claiming that he disbelieved. 1. The devils from the jinn used to be seated in stations in the sky for the purpose of listening in to the speech of the angels and then to use that to deviate the people [by claiming knowledge of the Unseen]. 2. Then they prevented from that after the sending of the Prophet (peace and blessings be upon him). So, they were no longer able to listen in. And the skies are defended and guarded with shooting stars that are thrown at the devils (among the jinn) that set them ablaze. 4. The devils (shayāteen) believe in their Lord yet that does not enter them into Islam. And that is the same for the unbelievers from the humans who believe in their Lord (i.e. Allah) but that does not enter them into Islam – that is because they refuse to submit and worship Him alone. As for the term Tāghoot, then it is derived from tughān which is to transgress and go beyond bounds in disobedience. And what is apparent is the tā (the t at the end) indicates an increase. Meaning that they are tāghoot because they fall in excessive and many transgressions. At-Tughyān is to increase in a matter that causes one to exceed and go beyond bounds. 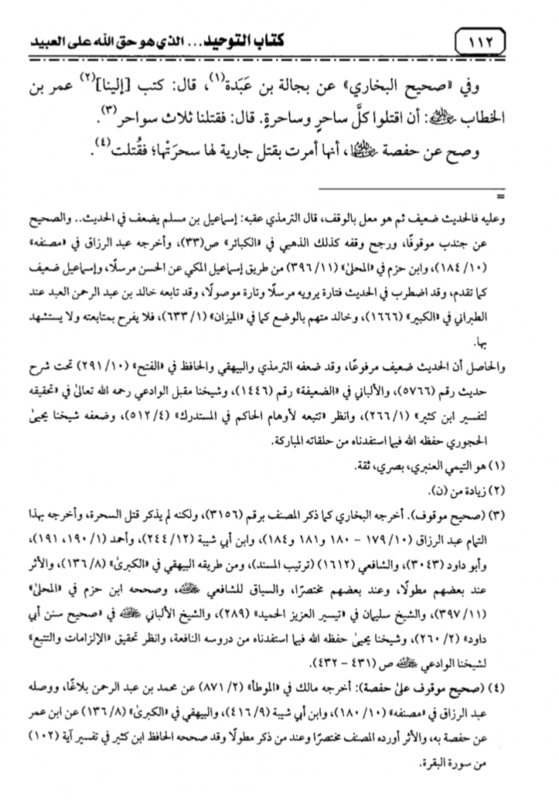 Then the Shaikh (Ibn Abdul-Wahhāb) brought the hadeeth of Jundub with takes the ruling of ascription to the Messenger (salallāhu ‘alaihi wasallam): “The legislated punishment for the magician is that he is struck with the sword.” This Companion is Jundub Al-Khair who watched the activities of this magician who claimed to have cut off the head of a boy and then returned it back. So, then Jundub came with his sheathed sword and when the magician started his tricks [once more], Jundub removed the magician’s head and it fell to the ground. He then said: “If he was truthful, he’ll return his own head back.” Then he said, “The legislated punishment for the magician is a strike with a sword.” [The legislated punishments can only be carried out by those in authority, and Jundub had that authority]. The Caliph, Umar Ibn Al-Khattāb (radiyallāhu ‘anhu) wrote: “Execute every male and female magician.” So they executed [upon his command] three magicians. It is reported authentically from the wife of the Prophet, Hafsah (radiyallāhu ‘anhumā) that she commanded that a female servant of her’s should be executed because she performed magic on Hafsah, so she was executed. So all of this proves that the magician/sorcerer is an unbeliever and magic itself is unbelief. And the one found guilty of magic is to be executed (male or female) by the strike of the sword through the Islamic Legislation sanctioned by those in authority, not through vigilante-type retribution (which is forbidden in Islam). It is understood from these narrations that the magician is asked to repent and then executed. Concluding note: If magic and sorcery were being practised in the time of ‘Umar (radiyallāhu ‘anhu), then what about today?! Magic in the time of ‘Umar was the remnants from the days of Jāhiliyyah. In today’s world, magic is practised and revered, and given an elevated station in literature, film and art. It is important that Muslims and all right-minded people keep away from these irreligious and satanic practices, and especially important is to steer children well-away from these harmful matters. 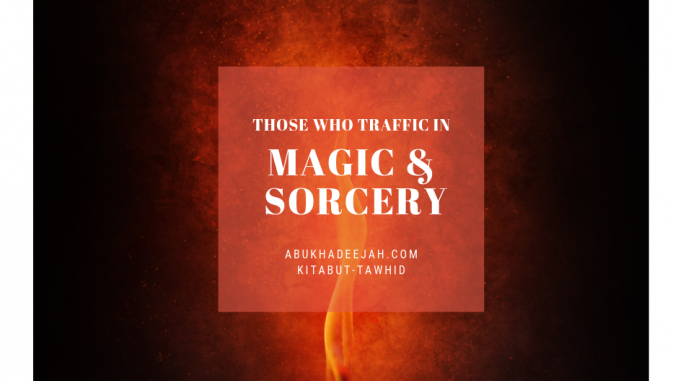 The practice of magic as described above nullifies Tawheed and exits a Muslim from the Islamic faith. 1. “Do not turn to mediums or necromancers. Do not seek them out and so make yourselves unclean by them. I am the Lord, your God.” Leviticus 19:31. A person who practises necromancy is a wizard or magician, and a medium is a soothsayer or fortuneteller. Reported by Bukhāri 6/45 in disconnected form; Ibn Hajr cited that is also reported with a connected chain of narration that is strong. See Fathul-Bāri 8/252. [1A] Bukhāri 6/45, in disconnected form; and declared hasan (authentic) by Muqbil Al-Wādi’i in his checking of the Tafseer of Ibn Katheer, 2/402. Plural of taghoot is, tawāgheet. Bukhari no. 2767; Muslim no. 89. Tirmidhi no. 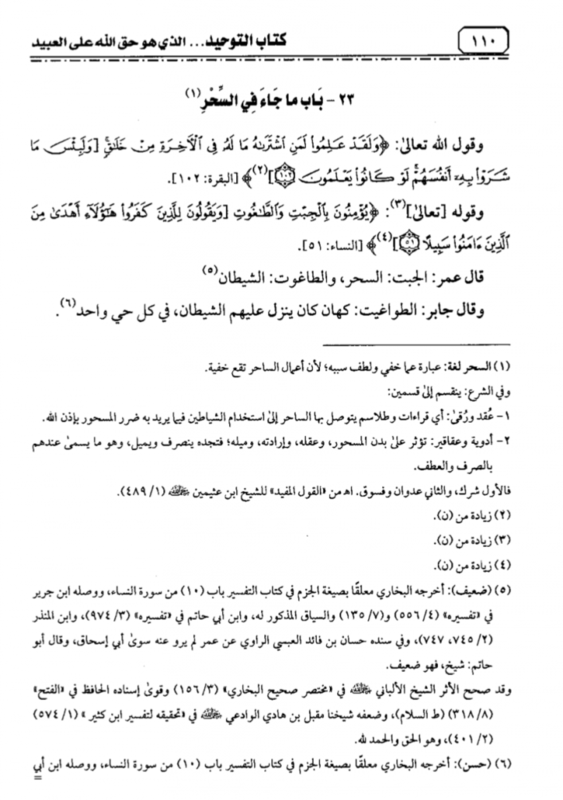 1460; the narration was declared weak (da’eef) by Al-Albāni in Ad-Da’eefah no. 1446. Bukhāri no. 3156; this wording is with Abu Dāwood no. 3043. 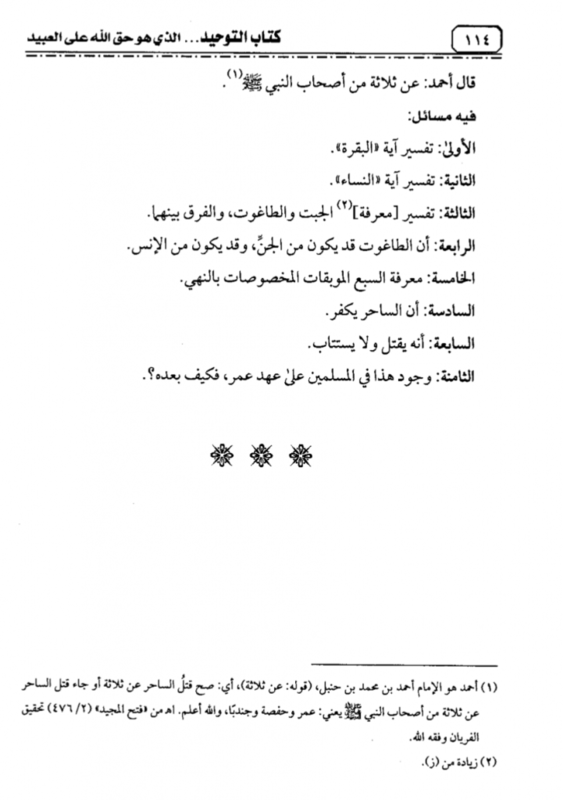 Mālik in Al-Muwatta no. 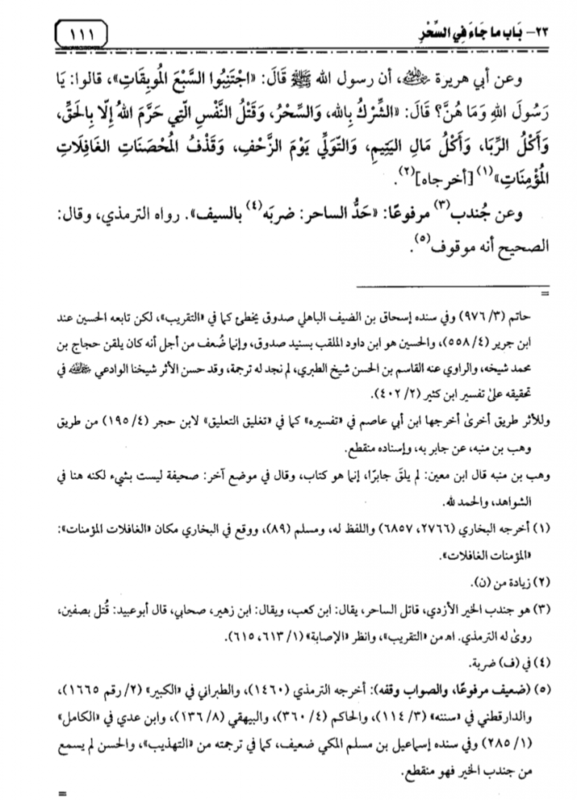 14; Al-Bayhaqi in Al-Kubrā 8/136 no. 16941. Bukhāri in At-Tāreekh Al-Kabeer 2/222 in his biography of Jundub entitle, “Jundub Ibn Ka’b, the executor of the magician.” Then he narrated with a connected chain of narration to Abu ‘Uthmān, “In the presence of Waleed there was a man (magician) who would behead a man and separate his head from his body, so we were amazed. Then he returned his head back to his body. So Jundub came along and killed the magician.” Reported by Al-Bayhaqi in Al-Kubrā, 8136.